Cee’s latest challenge makes me realize that I have been highly neglectful of photographing bathrooms, especially on a travel blog, since the presence (or lack) of bathrooms can make or break your trip! I vow to take more bathrooms in the future and meanwhile, here are some that didn’t get away. I was fascinated by the buttons on a Japanese toilet. This was in 2003 before I had a digital camera. Back then you didn’t waste precious film on photos of toilets! Japan actually had two very different types of toilets – the ultramodern ones (often labeled in English as ‘Western’) and the other, usually not labelled, which were old-fashioned squat toilets. The first time I encountered one of these was in Thailand in 1993 and I had some very awkward moments until I saw some muddy footprints on the western-style toilet seats in a mall. A sign like this would have helped as well… Who knows which type of toilets lurk behind these doors in Laos? The English word ‘Toilet’ seems to work in most countries (use a French accent in France or Belgium) but most languages have a set of euphemisms that change from country to country, even among those that speak the same language. In Mexico bathrooms are called ‘Baños’ or ‘Servicios’ or ‘Damas’ (Ladies) and ‘Caballeros’ (Gentlemen). But ask for a ‘Baños’ (Baths) or ‘Servicios’ (Services) in Spain and they just look at you strangely. I suppose it’s all those Brit tourists but there they are called ‘WCs’ like this public washroom on a beach in Spain. And in Spanish-speaking Honduras they call them ‘Sanitarios’ as this directory in the archeological ruins of Copan shows. Sometimes it is necessary to pay for the use of a toilet compounding the intimidation – just how much do you tip and just how much is this unfamiliar coin worth anyway? I like this one in Holland – the price and instructions are very clear, especially the last one which says ‘Run!’. Now for some more glamorous bathrooms such as this one in the Kasteel de Haar near Utrecht in Holland. 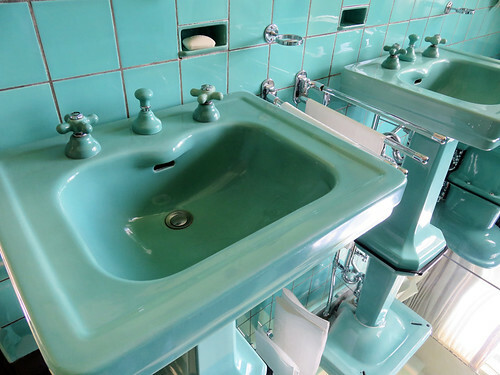 The turquoise bathroom in the Sonneveld House in Rotterdam, Holland. 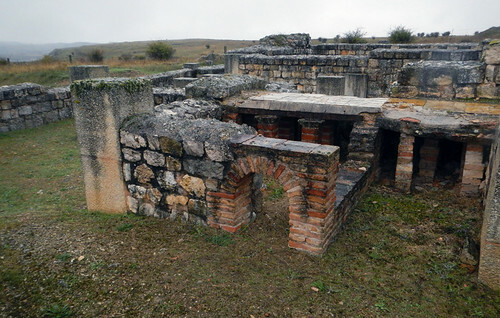 Roman bathhouse at Clunia in Spain. Did I say glamorous? How about this classic outhouse in amongst the trees in Merritt, BC? Ireland deals with its garbage problem in several ways, one is giving out awards for ‘Tidy Towns’ and ‘Top Toilets’ all over the country. This ‘Top Toilet’ is in Portmagee in the Ring of Kerry. This particular ‘Top Toilet’ was locked so, well not overly useful, I imagine it will stay clean and tidy for quite long time. We generally stay in cheap accommodation and I see that not single one of our hotel bathrooms has made it into these shots. Except for a glimpse of this bathroom in the Hotel Suraj, a former mansion in the city of Jaisalmer in India. More of Cee’s Fun Foto Challenge: Bathrooms or Outhouses. It’s amazing how different countries and cultures view this aspect of life. Great photos. Until I wrote this post I had never appreciated the cultural differences around something so basic as a bathroom!